Pictured above: The public is invited to learn about ocean research and engineering during the annual MBARI Open House. Packard’s very simple imperative—give the ocean more attention—has, in many ways, been the North Star of MBARI’s Information and Technology Dissemination Division, or ITD, since its inception over 20 years ago. The general public is still largely unaware that the world ocean is facing urgent threats like climate change, overfishing, and pollution. MBARI seeks to share its research, technology, and data with the public, key stakeholders, and policy makers so we can advance and inform conservation solutions. The division was established in 1996 by MBARI Board Member Ross Heath, who at the time was serving as interim executive director. Heath saw an opportunity to reorganize and streamline the operation of a maturing organization. The growing video library was fast becoming a major outreach asset, but other outreach activities—summer interns, the postdoctoral program, formal and informal publications, press releases, patents, collaborative agreements—were moving ahead without sufficient coordination. From its initial inception, ITD was led by Judith Connor, who first focused on getting the word out about the institute’s technology, discoveries, and people. 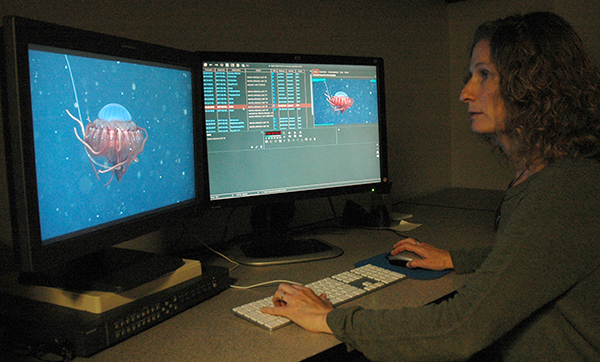 One of her chief goals was to improve access to and use of MBARI data, especially the unique deep-sea video recordings. Connor and her team launched the first MBARI Open House for the general public, published annual reports, and crafted a retrospective of MBARI’s signature accomplishments over its first decade. In addition, ITD initiated communication training and, working with MBARI software engineers, developed an enhanced video annotation system known as VARS (Video Annotation and Reference System). Senior Research Technician Kyra Schlining uses the Video Annotation and Reference System (VARS) to keep track of observations recorded during a midwater remotely operated vehicle dive. Photo by Kim Fulton-Bennett. The summer internship program was retooled and our work with the Monterey Bay Aquarium was enhanced to include collaborative education and public information efforts. After 25 years of service to MBARI, Connor stepped down in 2018 and MBARI brought on Heidi Cullen to lead ITD. An engineer and climate scientist by training, Cullen had previously transitioned to science communication and co-founded Climate Central, a research and journalism non-profit organization focused on highlighting the impacts of climate change. Before that she served as The Weather Channel’s first on-camera climate expert where she helped launch a weekly hour-long TV series on climate science and sustainability. Since starting at MBARI in February of 2018, Cullen has been focused on raising MBARI’s profile, strengthening the culture of outreach within the institution, and working with the Video Laboratory on a strategy for managing the pressing challenges of an ever-increasing stream of data. Looking back, MBARI 1.0 was about building a new institute and developing a shared language between scientists and engineers—a learning process that took about a decade. MBARI 2.0 began with the creation of ITD, which marked the turn from focusing inward to engaging with the external community. MBARI 3.0 was about developing new autonomous platforms aimed at establishing a persistent presence that took the lab and brought it out to sea in order to better monitor and understand the rapid change taking place in the global ocean. With each transition came an increase in the volume and complexity of the data being collected. One part of extending MBARI’s reach is Cullen’s efforts to work more strategically with the aquarium. With MBARI’s core strengths in research and technology and the aquarium’s outreach and advocacy expertise, together the two organizations can push the frontiers of ocean conservation. The goal is to target areas where MBARI technology can be applied to solving real-world conservation problems. 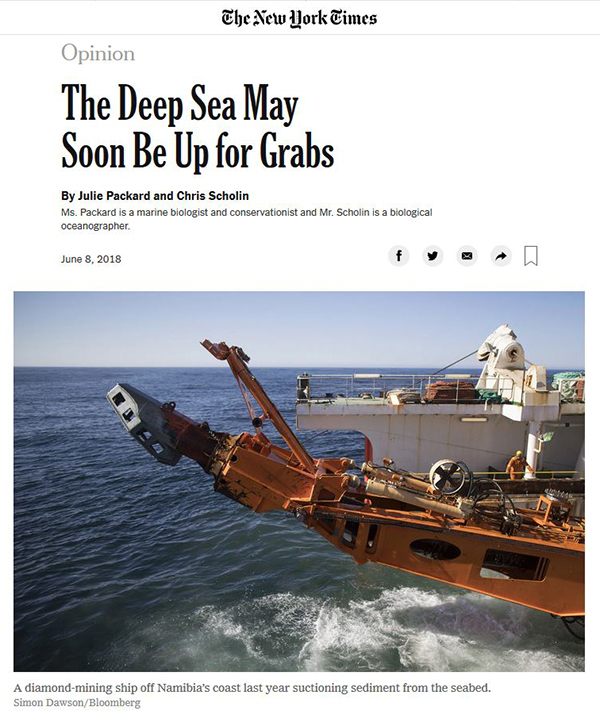 MBARI President Chris Scholin and Julie Packard, chair of the MBARI Board of Directors and Executive Director of the Monterey Bay Aquarium wrote an opinion piece for the New York Times to call attention to the threats facing the deep sea. Media coverage is, of course, central to increasing awareness of MBARI’s accomplishments. In 2018, more than 120 news stories featuring MBARI were published in outlets including The Economist, The New York Times, and National Geographic. Social media is also an important part of the outreach strategy. MBARI's YouTube channel launched in 2009 with a barreleye fish video—the video received one million views within a week and now has over 5.5 million views. In 2011, MBARI joined Facebook and Twitter and, in late 2015, Instagram. The institute has come a long way since first establishing a presence on social media, all under the direction of Susan von Thun, the institute’s social media manager. MBARI now has over 145,000 followers across all social media platforms and reaches roughly 40,000 people on a weekly basis. Senior Education and Research Specialist George Matsumoto and von Thun also served on the organizing committee (with Steve Haddock and Mariah Salisbury from the Science Division) for the Deep-Sea Biology Symposium. More than 450 people from around the world attended the meeting and MBARI staff had a presence in every session. Von Thun also coordinated all social media for the event. MBARI’s annual report, first published in 1996, also received an upgrade in 2018. For the first time the full report was an all-digital publication. Previous annual reports were only produced as printed books, with an electronic version in PDF format. The new and improved digital format allowed for the inclusion of more beautiful images, bigger photos, videos, slideshows, and maps and provided an interactive experience. The move to the digital report is also more sustainable as it results in a substantial savings of paper. 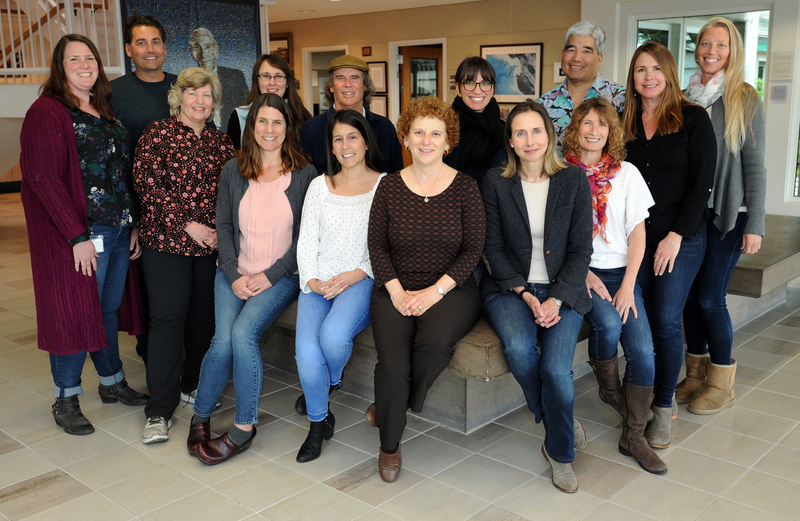 For 2019, ITD is embarking on a project to strengthen outreach at MBARI. “Our goal is to work in a more coordinated way with seagoing staff to better share MBARI’s research across all of our outreach platforms,” Cullen said. As part of the project, a drone and several action cameras have been provided for crew members to use at sea. Additional footage will be collected on some research cruises, as well as interviews with scientists and engineers about their research. “It’s all part of sharing MBARI’s amazing story of exploring the deep ocean and trying to better understand the rapid changes taking place,” Cullen said. The MBARI Summer Internship Program provides hands-on experience in science, engineering, and science communication projects. Photo by Todd Walsh. Education is also a priority within ITD. Led by George Matsumoto, the EARTH (Education and Research: Testing Hypotheses) program uses near-real-time data from ocean observatories to design and test outreach with the Internet as an interface to scientists, teachers, students, and the public. In the latest workshop, participating teachers developed 14 different lesson plans on topics ranging from ocean acidification to marine mammal stranding to ocean careers. 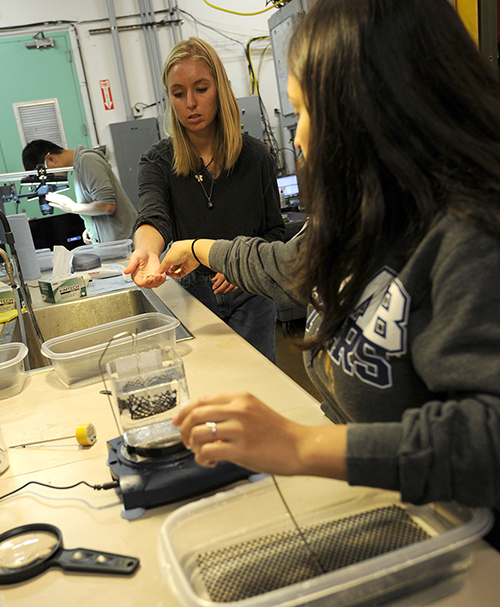 MBARI’s highly competitive summer internship program is now in its 23rd year. The 10-week program matches emerging young talent with MBARI scientists and engineers and provides hands-on research, engineering, and science communications experience. In 2018, 245 applications were submitted and 20 interns were selected. The WATCH (Watsonville Area Teens Conserving Habitats) educational program offers high school students experiences to connect with marine science, learn about conservation, and act on behalf of the ocean in their local community. The program is run jointly with the aquarium, with the involvement of several members of MBARI’s ITD and science groups providing mentoring for students. Through the Southern Ocean Carbon and Climate Observations and Modeling project, scientists partner with teachers and classrooms across the country to inspire and educate students about the role of the Southern Ocean in global climate. Students are allowed to name and track autonomous ocean floats that monitor the biology and chemistry of the Southern Ocean. So far, 90 floats have been adopted in 50 schools in 26 states and three countries. Float names include Lil Sinker, Polar Otter, and Doc Baldy (a combination of the tallest peak in the San Gabriel Mountains in Southern California and scientist Doc Ricketts). MBARI’s ability to collect data has grown with each passing year. With over 6.3 million unique pieces of deep-sea ecological information collected from over 24,000 hours of video logged, the institution is grappling with how to manage all these incredibly valuable and rare deep-sea data. One of the big priorities for the coming year is to draft a plan for how to manage that deluge of data. That will include decisions about how to incorporate machine learning into workflow of the Video Laboratory, managed by Nancy Jacobsen Stout. The plan will also address how and when to make the transition to the higher resolution 4K cameras, as well as how to manage digitization and data storage. Since its initial inception, the ITD team has been focused on executing David Packard’s vision and ensuring the ocean (and its data!) gets the attention it deserves. Given all the pressing challenges facing our ocean today, the urgent need for smart and strategic outreach is clear. The ITD team is up for tackling that challenge. The Information and Technology Dissemination Division. Back row, from left: Lonny Lundsten, Kris Walz, Kim Fulton-Bennett, Cassy Burrier, George Matsumoto, and Susan von Thun; front row from left, Larissa Lemon, Linda Kuhnz, Katie Lage, Krystle Anderson, Nancy Barr, Heidi Cullen, Kyra Schlining, and Nancy Jacobsen Stout. Not pictured, Megan Bassett. Notice MBARI Founder David Packard looking on from behind the group. Photo by Todd Walsh. Developing an observatory to monitor the health of a coral and sponge community.